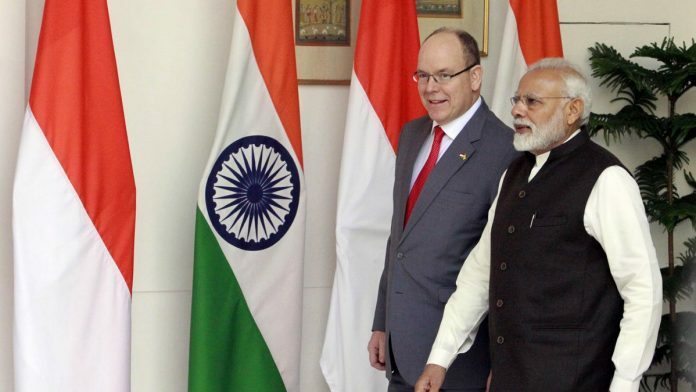 New Delhi: On Monday, Monaco’s head of state, Prince Albert II arrived in India for a week-long bilateral visit. He met Prime Minister Narendra Modi Tuesday, where the two leaders talked about stepping up cooperation in combating climate change and in the renewable energy sector. ThePrint takes a look at the principality on the French Riviera that’s synonymous with an iconic Formula One Grand Prix race and considered a playground of the rich and famous. Is Monaco a separate country? Who heads it? Monaco is a 2-sq-km country, surrounded by France on three sides and the Mediterranean Sea on its South. Prince Albert II heads the ultra-rich microstate located on the French Riviera in Western Europe. The country has a population of 38,400 (2015) — where local Monegasques, French, and Italians account for about three-quarters of the population. Albert belongs to the House of Grimaldi, an Italian aristocratic family, which has ruled over Monaco from 1297, with a few brief interruptions. Monaco really rose to global fame when the extremely popular American actress of the 1950s, Grace Kelly, married the then head of Monaco, Prince Rainier III, in 1956. The two had met at the Cannes Film Festival, where Kelly was heading the US delegation. Their marriage attracted a lot of American media attention. This led to a rapid surge in interest towards Monaco among American businessmen and celebrities. Monaco is a microstate, which can be seen as one of the leftovers from Europe’s consolidation into nation-states. Europe features six more such microstates, such as Cyprus and San Marino. These microstates have survived for so long and succeeded by leveraging their greatest advantage — their sovereignty. They can effectively do what they like. They create unique businesses by offering the residents of neighbouring countries to do something that they generally can’t in their own nations. For instance, Monaco first opened a casino in 1856. And in more recent times, it has developed as a tax haven and a lucrative site for offshore finance companies. Its exemption of income tax has led to many celebrities setting up home here. They include a number of F1 racers from Lewis Hamilton to David Coulthard and Max Verstappen, tennis star Novak Djokovic and even singer-songwriter Bono, the lead vocalist of the band U2. Over the years, such business models have allowed Monaco to develop as one of the wealthiest states in the world. According to Wealth X — a leading intelligence and market research firm on Ultra High Net Worth — one in 50 residents are worth more over 30 million Euros. And the country boasts of the highest per capita income in the world at $1,68,000. Often tourists visiting southern France are advised to take a day trip to Monaco. This trip would involve looking at ultra luxurious villas and their customised cars, sipping the finest of French wines, and being served by some of the most renowned chefs in the culinary world. Indeed, beyond a site for gambling and offshore finance, Monaco has developed a tourism industry – which literally involves local residents displaying their wealth. An interesting display of Monaco’s lifestyle and its effect on tourism can be witnessed at the annual Monaco Yacht Show. In 2016, 34,500 visitors flocked to Monaco to admire 125 superyachts, which had a collective value of 2.7 billion Euros. A superyacht is a luxury yacht that is permanently crewed and has a load line length of 24 metres or above. Intriguingly, putting swimming pools and helicopters on their 150-metres long yachts has become passé. The recent trend is to have your superyacht be accompanied by another ancillary — a support vessel. These support vessels are used to carry sea toys such as jet-skis, speedboats, and Vespa scooters. Recent developments are starting to gradually alter the ways of Monaco. Forced by neighbouring European governments and international institutions such as the Organisation for Economic Co-operation and Development (OECD), the Monacan government has strengthened some of its tax laws. Monaco has signed transparency agreements with the European Union, which now forces the government to exchange tax information with other countries. In the wake of the 2008 Global Financial Crisis, these governments, searching for offshore money to bridge their budget deficits, decided to target Monaco. While this has reduced the value of Monaco as a destination for offshore financial companies, gains are emerging in a different sector. In the past few years, the prime driver of economic growth has moved to an outrageous boom in the real estate sector. According to Savills, a global real estate services provider, the average real estate sale price in Monaco is 41,400 Euros per square meter (2016). This is three times the average price in New York. In 2017, on average a house sale fetched 4.5 million Euros. Buyers deserting the traditional real state markets of New York and London are moving to Monaco and driving up these prices. This real estate boom, however, is having an unexpected consequence. Long-term residents are beginning to leave Monaco. They complain that the nuisance from the construction activity, increasing crime and day-trippers from France are diluting their Monaco experience. This older generation of residents quibbles over how Monaco is beginning to lose its glamour and exclusivity — the very reason they moved here.